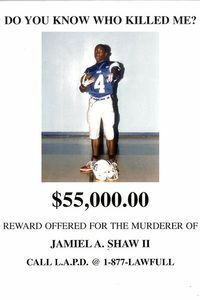 Jamiel Andre Shaw II was a promising L.A. football star who was gunned down just shy of his 18th birthday. Bill Simmons tries to make some sense of a senseless tragedy. On Tuesday afternoon, I witnessed a superhuman act of strength. We were gathered inside the West Angeles Cathedral on Crenshaw Boulevard, a mammoth facility with a balcony and video screens that’s like a concert hall crossed with a place of the Lord. Only a few funerals each month happen here, mostly for Los Angeles celebrities and people with ties to the church. For Johnnie Cochran’s funeral two years ago, every one of the cathedral’s 5,000 seats was famously filled. It’s the type of place you wouldn’t expect to see a 17-year-old kid lying peacefully in a coffin, not unless he was related to a singer or a politician or something. But that’s who was there, and that’s who we came to see. Sitting in the front row, an older man wiped a black handkerchief against his eyes and kept burying his head into his hands, as if he couldn’t summon enough power to watch the proceedings. He had been repeating this cycle for most of the previous hour, digging that handkerchief against his eyes, burying his head in dismay, looking up at that coffin, then beginning the whole process again. The man seemed broken. You couldn’t even say he was grieving. This was something else. I spent much of that hour watching the man and his wife, as well as their 9-year-old son sitting unflinchingly between them. The boy never moved. He sat upright in his chair, listening to everybody speak, unfazed by the sniffling and the wailing, frozen by everything that was happening. His mother was sobbing intermittently and feeding off the church’s singers, especially during a stirring rendition of “If I Ain’t Got You,” as she raised her hands and swayed to the music, pulling her hands back toward her body and sucking force from the words. At one point, I glanced at my program and noticed the broken man was scheduled to speak. This seemed impossible. He couldn’t even keep his head up … and he was going to say something? The moment came and the man unfurled himself from his seat, took a deep breath and staggered toward the podium. When he kicked things off by saying, “This is gonna be hard for me,” his voice cracked and it seemed like that would be that. He would cry, and he’d keep crying, and then he would collapse against the podium, and four relatives would rush up there and help him back to his seat. That’s how this would play out. I would have bet anything. Somehow, the man summoned the power to keep talking. Once the words started coming, he gained more and more strength, and within a few seconds, he was giving a poignant speech and attempting to place his son’s life in perspective. When he finished speaking, everyone in the church — maybe 1,200 mourners in all — stood up and applauded him. I don’t know how he did it. I will never know how he did it. To understand the meaning behind his words, you need to understand what brought everyone to the cathedral on a sunny Tuesday afternoon. 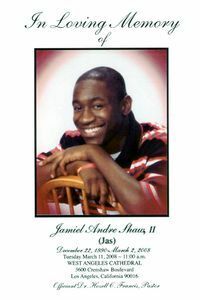 We came to mourn Jamiel Andre Shaw Jr., a 17-year-old junior from Los Angeles High who everyone called “Jas” (pronounced “Jazz”), the nickname that initially belonged to his father before Pops graciously handed it down. On the first Sunday night in March, Jas was walking home in Arlington Heights when two Latino gangbangers started eyeballing him from a trailing car. Jas kept walking. When they hopped out of their car and approached him, Jas stopped just 40 yards from the front door of his house, the same distance he dreamed of running for NFL scouts some day. That’s a loaded question on the streets, code for determining someone’s gang affiliation. Give the wrong answer and that’s that. Since he didn’t belong to a gang, Jas decided against saying anything. Maybe he was thinking about that last 40 yards. Maybe he thought they wouldn’t shoot a star running back. Maybe he believed that silence was his best recourse. Maybe he was too scared to say anything. They shot him anyway. Twice. 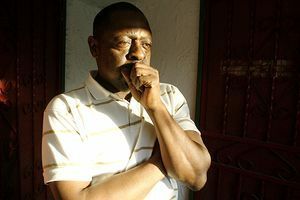 Sitting inside his house, Jamiel Shaw Sr. heard the unmistakable sounds of gunfire and dialed his son’s cell phone to warn him. Senior spent all 17 years of Junior’s life terrified that something bad would happen, that his son would wind up in the wrong place at the wrong time, that he’d talk back to the wrong person, that he’d be riding in the wrong car on the wrong night. He desperately wanted his son to reach 18. That was his only goal as a father. Eighteen. He even dubbed it the “18-Year Plan” to bang home the point. Eighteen meant college. Eighteen meant Jas never became a casualty of the streets, that he never found himself in the wrong place at the wrong time. Eighteen meant Jas was relatively lucky. Minority kids in Los Angeles, whether black or brown, need a little luck to make it to 18. Not a ton of luck, but a little luck. Just a smidge. You never know. Over the next few days, friends and family would wonder what happened and, more importantly, why it happened. How could the world be this cruel? Why would anyone want to kill a boy who did everything right? And Jas did do everything right. He studied and attended class. Stayed out of trouble. Treated people with respect. Listened to his parents. Took care of his little brother. Played football so well that his league named him most valuable player as a junior. Carried the football so beautifully (averaging more than 14 yards per carry!) that his coach compared him to Houdini. Showed enough promise that schools like Stanford and Arizona State were recruiting him. 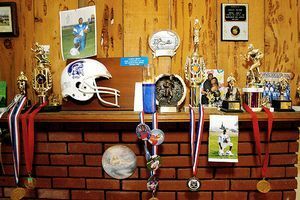 The son dreamed of playing football in college and the NFL, then pursuing a second career as a sports agent. The father simply dreamed of seeing the son turn 18. When Jas came up 10 months shy, his senseless murder received national attention because of his football ability and a fascinating wrinkle that his mother, Anita, happened to be serving the country overseas in Iraq. The Associated Press filed an extensive story that landed in nearly every newspaper and on nearly every Web site. CNN filmed an interview with Anita Shaw for Anderson Cooper’s show. The Los Angeles Times wrote an initial story and a few days of follow-ups. Every L.A. network led its newscast with the story. There was a candlelight vigil after Jas’ death that attracted a phalanx of cameras. At Tuesday’s funeral, I half-expected to see a couple of Hollywood executives lingering afterward, hoping to purchase Jas’ story and turn him into the Cornbread Hamilton or Ricky Baker of his generation. None of that happened. Jamiel Shaw’s funeral turned out to be unfathomably sad. It’s tragic any time a parent outlives a child, or a teenager is slain for no reason, but the mourning process jumps a level if it’s a gifted athlete getting chopped down before his prime. There’s a reason A.E. Housman’s “To An Athlete Dying Young” gets taught in nearly every high school poetry class; there’s a reason students always respond to that poem and remember it. The finest prep athletes achieve a level of notoriety that dwarfs everyone else in school. They’re envied and respected, admired and coddled, cheered and idolized. Everyone else would trade places with them in a heartbeat. It’s a gift; not an important gift, not a life-altering gift, but still a gift. When that gift gets taken away, it gets taken away from everyone. … everyone at Jamiel Shaw’s funeral would respectfully disagree. When a screwed-up city like Los Angeles claims someone like Jas, the pain goes beyond a gifted kid getting cheated out of a bright future and even beyond the community losing a much-needed role model, the successful product of a two-parent family, someone who set a constant example for everyone younger than him. Jas’ death makes all of us feel vulnerable. If the anointed ones can’t make it, then who can? Which is precisely why a community has no chance of snuffing out these gangs, no matter how much money is raised and how many people get involved. There will always be reasons for people to join a gang, just like there will always be reasons to stop them. The commitment has to come from the top. Almost always, it does not. There was a certain symmetry to Jas’ funeral occurring two days after the final episode of “The Wire,” the groundbreaking HBO show that over five seasons detailed the decay of Baltimore, a city that rotted like a fish from the head down. The good guys rarely ended up winning on that show. In one memorable moment during the final season (note: spoiler warning from this point on), detective Jimmy McNulty found out budget cuts had curtailed his ongoing investigation of Marlo Stanfeld, the city’s reigning drug kingpin. He couldn’t believe it. McNulty ended up rigging a murder investigation, turning the city upside down for a few weeks, somehow bagging Marlo and his crew, then losing Marlo on a techicality and getting asked to resign. That’s the thing about real life — guys like Marlo do get to win. Through the wisdom imparted in 60 grueling episodes, “Wire” fans learned rudderless cities are helpless against drugs and gangs. You need politicians willing to make substantial commitments to police and schools. You need a never-ending reservoir of money. And, even then, that’s probably not enough if drugs and gangs are the only options for so many impoverished teenagers. When Jamiel Sr. made his point about “the right reason for them,” I thought instantly of Marlo, an icy character who never lost his cool until the second-to-last episode, when he finds out in prison that a street foe had been calling him out on the streets but nobody bothered to tell him. Marlo upbraids his minions with a stream of obscenities, finally screaming in frustration, “MY NAME IS MY NAME!” For him, that was all that mattered. His name and nothing else. In the final episode, after his lawyer sprung him of all charges — but with the caveat that Marlo sell his business and never go back to dealing drugs — there is an incredible scene in which Marlo leaves a cocktail party filled with elite Baltimore businessmen, unable to handle the thought of inhabiting their spineless world, ultimately walking the streets and picking a fight with two thugs on a street corner. After landing two blows and sending them scurrying, the scene ends with Marlo checking a wound on his arm, tasting the blood, laughing and standing proudly on his new corner, reclaiming the streets if only for those few seconds. You could say Marlo was wrong for being a drug dealer, but, to steal a phrase from Jamiel Sr., it was the right reason for him. Marlo’s character became a defining character on the show, an unredeeming villain who embraced street life and everything that came with it. We never met Marlo’s parents and didn’t need to meet them — he was created by Baltimore itself, a city with reprehensibly bad schools and too many one-parent and no-parent families, a city that left its young kids to mostly fend for themselves. The show’s fourth season revolved around four teenage friends, all of whom started out with good hearts even though they had little chance of making anything of their lives. By last weekend’s final episode, three of the four were hopeless — one stuck in a group home, one hooked on drugs, one resigned to life as a street thug — with the fourth finding salvation from an adopted family. When we saw the fourth speaking about AIDS in Africa at a Baltimore city debate this season, it was an especially rewarding moment because we knew the odds had been stacked so dramatically against him. That’s why those 60 episodes were so special as a whole: They didn’t just tell you that things were bad, they showed you why things were bad and why things had so little chance of ever changing. The show’s enduring point was there will always be more people like Marlo, Omar, McNulty, Prop Joe, Bubbles and Carcetti; everyone was filling a certain role, the principles of a messed-up city were more cyclical than anything: nothing will really ever change. You could say the same about inner-city Los Angeles, an area ravaged by violence and poverty that seems utterly entrenched in its ways. The city’s police force is woefully and comically understaffed, and most public schools are sketchy enough that the competition for spots in private schools and respected public schools starts as early as pre-K. There’s a festering feud between Latino gangs and black gangs that has been threatening to boil over for years, a problem that, ironically enough, would have been the theme for the sixth season of “The Wire” had HBO ignored feeble ratings and allowed creator David Simon to keep the series going. And thriving. According to a story in Wednesday’s L.A. Times, the alleged killer was a 19-year-old member of the 18th Street Gang who had been released from prison a day earlier. 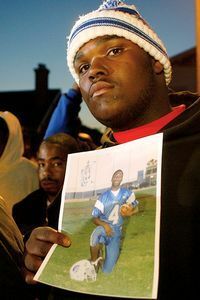 LAPD Chief William Bratton explained the killer mistook Jas for a member of a rival gang, the implication being that his death, for lack of a better word, was a mistake. Of course, we know better. When somebody commits murder because they’re trying to make a name for themselves or defend some arbitrary stretch of turf, that’s not a mistake. It’s terrorism in its most basic form, an excessive use of fear to accomplish a goal. Whether we do anything about it remains to be seen. When Jamiel Sr. emerged from a sobbing heap, stood on wobbly legs and vowed to keep his “18-Year Plan” going, I desperately wanted to support him and felt humbled by his strength. But I couldn’t shake the memory that, once upon a time, the man felt obligated to start an “18-Year Plan” in the first place. RIP, Jas. You almost made it.